JOIN US ON WEDNESDAY, February 27! The annual WBD Seminar Series will make a 12-stop tour in February and March of 2019. At each stop, WBD Training Staff and Loan Officers will provide updates and insight on SBA lending and changes to the 504 loan program. – New tools that can help you stay sharp on the 504 program all year. – A look into one of Wisconsin’s largest commercial portfolios (WBD) to see what is trending and share insights. – The Seminar is FREE! Join us at the Tuckaway Country Club in Franklin! Registration and networking begin at 1:00 p.m., with the seminar starting at 1:30 pm. 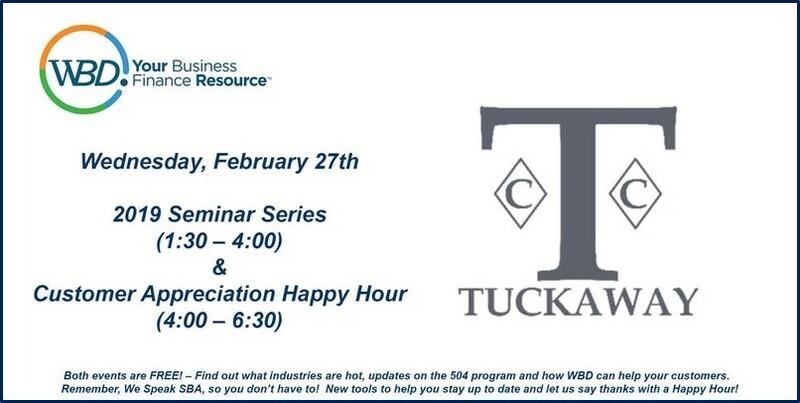 Feel free to stick around after the seminar series concludes to join us for a customer appreciation happy hour beginning at 4:00 p.m.
For more information, contact Tricia Beacom at tbeacom@wbd.org or 920-966-1499. And click here to REGISTER NOW for the WBD 2019 Seminar Series – Franklin!